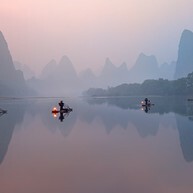 Guilin has long been a favourite among travellers to China. This compact city is most famous for the green mountains, crystal clear waters, unique caves and the beautiful cliffs in its outskirts. The karst peaks and the surrounding areas are world renowned for its beautiful scenery. Yet it is not only this stunning landscape that draws visitors to Guilin, but its unique folk customs, that make for unforgettable experiences in themselves. Opening hours: Office hours are 8.30 am-5 pm from Monday to Friday. Banking hours are from 9 am to 5 pm on weekdays (until 4 pm on weekends). Most malls and supermarkets close at 10 pm. 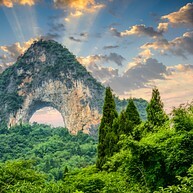 Guilin is famous for its extraordinary karst landscapes and exotic local culture of ethnic minorities. Major attractions in Guilin include the Li River, Elephant Trunk Hill, Reed Flute Cave, Seven-Star Park and Longsheng terrace fields. The city’s pride is that it is just like a stone museum where amazing geological finds are displayed. 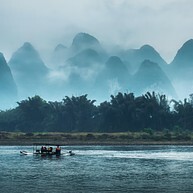 If Guilin is a living entity, the Li River is the absolute soul. Originated from Mao’er Mountain, Li River starts its journey from Guilin down to Yangshuo, just like a jade ribbon winding among the green hills to form a most poetic beauty spot. The reflection of the fantastic karst peaks in the water, the cowboys, the fishermen at leisure and the simple households along its banks are mesmerizing. The section from Xingping Town to Yangdi is the highlight of this magnificent picture scroll. The landmark of the city, also known as Elephant Hill, looks like a giant elephant drinking water from the river with its long trunk. Other famous spots here include Shuiyue Cave (水月洞), Puxian Tower (普贤塔), Xiangyan Rock (象眼岩), Dagoba Tower (舍利塔), Yunfeng Temple (云峰寺) and three amusement islands by the lake. The park is great for spending an idyllic afternoon. This is not just a park, but a representative scenic area covers more than 120 hectares. The park contains rivers, mountains, Chinese gardens, traditional architectures and an underground cave. The Seven Star Cave in the park is a fantastic karst cave with a large number of stalagmites and stalactites, which transform the cave into a surreal place. 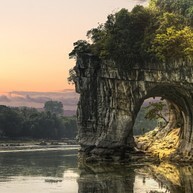 If you can only visit one place in Guilin, this should be it. 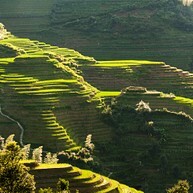 The Longji terrace fields date from the Ming Dynasty, about 500 years ago. Winding from the base up to the top, it divides the mountain into layers. Sights alter here as the season changes: water glittering in the sun in spring, green rice shoots in summer, golden rice in fall and silvery frost in winter. It is advised to stay overnight so that you can see the sunrise and sunset, which should not be missed. The Yulong River is a big tributary of the Lijiang River, flowing along scenic hills, plains and villages down to Gongnong Bridge. Hiking and riding around the river are also good ways to enjoy the view. Drifting on a bamboo raft is especially recommended for views that you cannot see from the banks. There are usually two seats on the raft and space is large enough to have bikes onboard as well. With many docking places on the route, it is possible to choose to tour the river for the whole length or in sections. Guilin is one of the cities in China that posse the most ethnic variety, which provides the area with an extremely rich and unique customs and cultures. The folk song culture, among others, is the most well-known and representative example. The impression of Guilin is a large-scale performance that creatively combines the classical folk songs, ethnic culture and the fishing lights, reflecting a harmonious atmosphere between the people and nature here. Relatively newly discovered by native villagers, the cave is extensive and unaltered, full of narrow, maze-like passages, and countless stalagmites. It is not advised to go without a guide, a crash helmet and a flashlight. The entrance is accessible only by boat and the whole trip would take approximately 2 hours. Near the exit of the cave, there is a mud bath onsen. However, given that the cave is not fully explored, the absence of certain security measurement exists. Thus going in alone is not recommended especially after 16h. 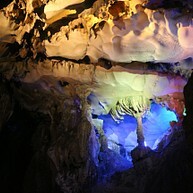 Contrary to Longmen Cave, Guanyan is one of the best-equipped cave in Guilin. The cave contains 3 floors. The first floor is an underground river that's accessible only by boat, followed by an elevator that goes through a waterfall and leads to the second and the third floor. And then, a single-seat railcar will take you out of the cave and continue a little odyssey for 3 kilometres, and you can see the breath-taking landscape alongside the river coming towards you. The natural beauty of this tremendous forest area is breathtaking. Tiny mountains pop up out of the flat landscape and forests of unusual trees and plants cover the mountains like fur. Among all the mountains, the Moon Mountain is the most distinguishable with its giant and perfect round hole in the middle. Changing with the seasons, the landscape in this lush nature park is the ideal place to relax a tired body and mind while listening to the melody of nature. The night cruise on the rivers and the four lakes Banyan Lake, Wooden Dragon Lake, Gui Lake and Shahu Lake in Guilin is spectacular. 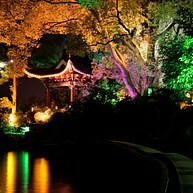 Due to the innovative use of lighting in the gardens and buildings along the lakes, the bridges, buildings and pagodas are beautifully illuminated. Singers and dancers along the shoreline complement this fantastic experience. 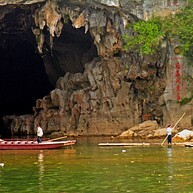 Considering that Guilin is a touristic city, this village remains relatively little commercialized and well-preserved. The part of Lijiang River that flows through the village is the most beautiful section, so beautiful that the image on the banknote of 20RMB depicts this exact location. Be weary of scammers in the village who have been known to trick tourists into buying worthless things at hiked up prices. This village is located inside the Longji Rice Terrace scenic area, constructed on top of a mountain, separated from the outside world and only accessible by an hour's walk. It is a village of Yao people, a minority branch, made up of hundreds of stilt houses. If you want to watch the sunset or sunrise, this would the perfect spot. There are hotels in the village where you can stay for the night, and spend some time enjoying the tranquility of nature.